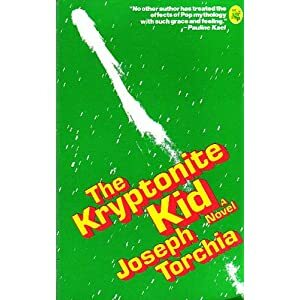 I first heard of The Kryptonite Kid from Neil Gaiman, in a post on his blog in which he was replying to a review in which Adam Mars-Jones stated, “Superhero fantasy is unsuitable as a serious theme for literary fiction, for much the same reasons that Pot Noodles are out of place at dinner parties.” I love examples of Superman being used as a vehicle for illuminating facets of the human condition, and Neil has nearly always steered me right, so I tracked down a copy. At the last, from the last word of the last sentence in the last paragraph of the last chapter, they would find themselves booted, ejected and expelled, from Joseph’s world as emotionally wrecked, as broken and hopeless, and as forlorn, despairing, and defeated as at the last is his protagonist – a seven year old American schoolboy who believes as did most of us on our ways out of first grade that Superman is real. It’s true that there is a lot of despair in the book. Jerry spends much of it forlorn. [SPOILERS] And by the end, he is physically wrecked. [/SPOILERS] The reviewer is wrong, though — or, at least, fails to see the light within the darkness that I see. This book is a profound story of faith, of man’s relationship to God and, in the end, of God’s relationship to man. Jerry Chariot is surrounded by cruelty and abuse. Much of it is coming from those who should most be demonstrating God’s love to him: his father, his mother, and the nun at his school. Both despite and because of this, he manages to find God elsewhere, in the form of Superman. And he maintains this faith, even when everyone tells him that Superman is not real, even when his father shows him the obituary of the actor who played Superman, even though everyone challenges him that he’s never seen Superman or been to Metropolis, even when he can’t find Metropolis on a map, even though Superman never writes back. He believes in Superman with a faith that will not be shaken. There are continual comparisons made between Superman and God, and Superman and Christ, as Jerry approaches his First Holy Communion. Jerry, in his letters to Superman, comes right up to the edge of articulating the idea that Superman has become his stand-in for God. Jerry has an unshakable faith in Superman, as he is meant to have faith in God. Jerry loves Superman like he has been taught to love God. Jerry’s father ultimately shows his love for Jerry as Christ showed his love for all mankind, finally embracing the role that God intends for all fathers by manifesting God’s love to his family. It is a dark book, and a difficult book, but also an amazing book. It is, contrary to the reviewer above, an ultimately hopeful book. And it is one that has continued to haunt me since I first read it. As a survivor of all types of child abuse who was abused by parents, extended family and people outside the family including nuns and priests I was deeply touched by this book. Many abused children who are without any help form any adult in their life find creative and imaginative ways to deal with the ongoing pain of getting through the next second and the next and the next and dealing with their utter aloneness. I salute the author and his little hero.